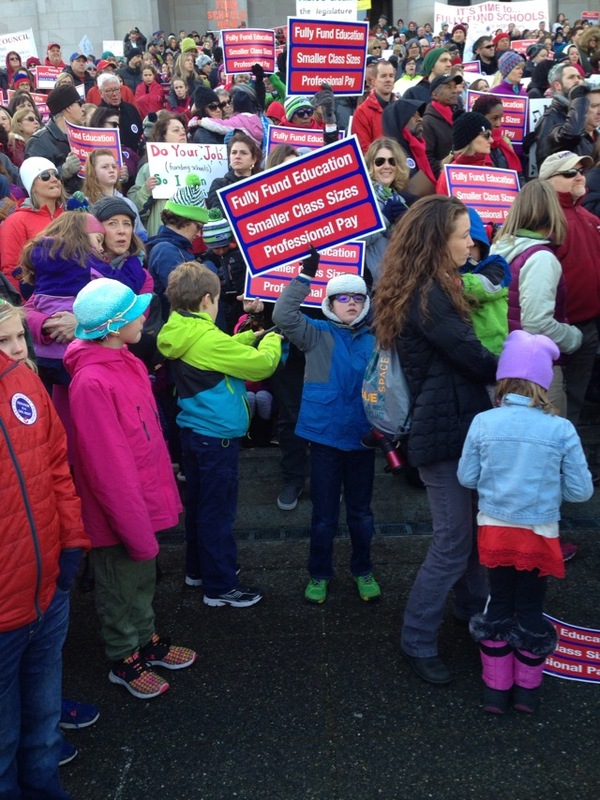 We took the kids to their first rally this past Monday, (MLK Jr. Day) at the Washington State Capitol in Olympia. It was a gathering of nearly 7000 similarly minded folks advocating for the Washington State Legislature to fully fund (as the Washington Supreme Court has already mandated) public school education in our state. As is stands now, without any action being taken, the public schools will fall 10's of millions of dollars short of what is required for this funding, leaving school districts such as Seattle no choice but to cut already thin staffing and operations. In short, there will be a lot of students, especially those in low income areas where there is no outside support, such as from a PTA to supplement funds, left behind in critical area's. We felt it was important for us to be there on Monday, with the kids, to voice our concerns and to give a visual reminder to our legislators that the impact is not simply in numbers, but that real live kids will be negatively affected without action being taken. As it turns out, it was a cold morning, and both kids had a limit to the time they could be out there in the cold without a proper meal, so we left after a few hours, trusting our more experienced and savvy friends and PTA members to follow up directly with our legislative representatives. But the message was certainly heard. Both by said legislators, and by Lukas and to a lesser extent, Annabelle (who's 4). Having a voice, and acting on it - even if in a small way - does make a difference. Mrs. LIAYF and I look forward to many more opportunities with the kids to get involved, and to make our bit of difference on important topics to us. No matter how big that is, it's a lesson in democracy we are happy to be teaching them. Who knows, maybe someday they will help change the world for the better!